Football season is finally back, and that means fantasy football is in full swing. Whether you are planning out a season long league roster, thinking of playing daily fantasy football for the first time, or you’re just a casual fan that wants to have a little bit more insight into the game, this is the place for you. We are huge fantasy football fans here, but we love the game itself, too. Regardless of your level of experience, or your knowledge of the game, you’ve come to the right place. If you’re new to fantasy football of any sort, having a firm knowledge of statistics is a must, but there’s a lot more to it than this. The best fantasy managers know that there are little things about predicting a player’s performance that statistics will never tell you. That’s why being a fan is so important to your success and enjoyment. Once you combine these two things, you will find that your understanding of football increases, and you can make more money in fantasy sports than ever before. It’s a nice spot to be in. It gives you more enjoyment when you are watching games on Sunday afternoon too. Who doesn’t like winning money? There are two types of fantasy football players: the casual kind that plays with just their friends all for the sake of being social, and the serious kind that plays to win, no matter what kind of league they are playing in. Everything else can change around these two types of fantasy players, but the mindset of the people drafting teams won’t change. Which one of these are you? Odds are, you are serious about the game. That’s probably why you’re here. But maybe you’re here because you want to become more competitive. Both are great. They show that you are determined and that you have potential. That’s where we come in. If you want to be successful over the long run at fantasy football–of any variety or stakes level–you should be a fan first. This will give you the basic enjoyment that you need to stick with it, and it will give you a framework of interest to encourage you to learn more. These are the basic building blocks of fantasy success. There’s a bigger, yet far more subtle, component where being a fan will help you out. It gives you a way to better determine the outcome of individual matchups that stump so many fantasy “experts.” This is something that seems commonplace to many rabid fans, but the stats fan might never see it. For example, if you know that the Green Bay Packers have a weaker than normal offensive line and that they are going up against the Detroit Lions, who has a better than average defensive line, you can make a decent guess that Aaron Rodgers will not have an above average game for this matchup. He might be your current go-to quarterback, but in this particular instance, perhaps starting him is not your best choice. If you are in a daily fantasy football league, you will know that he is not your top choice for drafting, especially as his value will not be very good. A fan will see this instantly. A stats geek will just see that Rodgers has great numbers and will infer that that means he will keep having good numbers. Balance will win out almost every time when it comes to just being a stats expert or just being a fan. Being a football fan that plays fantasy football is by far the better alternative. If you are new to fantasy football, or if you are transitioning to daily leagues, you will want to see improvement in your game. There are a lot of things you can do to get better, but the best way is to just get started and gain some experience. 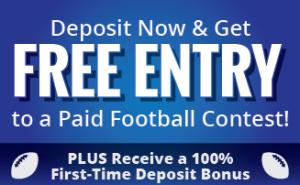 Lots of daily fantasy sports sites have free football tournaments for you to enter. FanDuel and DraftKings both have excellent platforms with a lot of players that use their sites. Playing for free will get you started, and when you do decide to deposit money, they both will allow you to get a bonus amount added to that deposit as a thank you. Now, with current law changes there will be so many other ways to play the sports market. A draftkings sportsbook is under development and it could change the way we watch sports. We’ll have to wait and what happens next. When you begin playing for money, monitor how you play and your level of success. You want to get better, not stay in the same spot. Try little changes to how you draft your teams. If you want to play in a season long league–which we highly recommend–note the differences in which players contribute better in the different scoring formats. Being able to switch between yearly and daily leagues with equal success is a tough thing and not something that most players can do. When you gain this knowledge, you will find that your knowledge of each type of league will help you to prepare better for the other. Finally, remember that this is supposed to be fun! Don’t let the stat analysis take away from the fact that you are first and foremost someone that loves the game.